CD Audio, Jewel Case with 4 page booklet, 42'07"
Peter Head - Yamaha Grand, Laffargue Upright, Vocals. 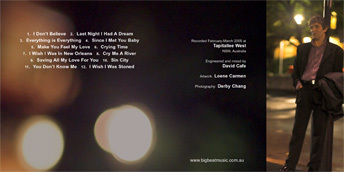 Liner notes by Vince Lovegrove; artwork by Loene Carmen; photography by Derby Chang. If you've ever lived and loved the night life, chances are, at some stage during your carousing, cruising, boozing and late night losing, you'd have come across Peter Head. His self-penned sublime songs and lyrics tell tales tall and true about Australia's crooks, hookers, pimps and thieves. Head's night time netherworld of ivory tickling in smoke-filled rooms, singing wayward songs about wayward people, is unique in Australia, our very own musical journeyman; always outside the crap and corruption of the music industry, always laying down a magical rolling chord, a riff, a poignant lyric, a primal-honed voice - frayed at the edges as it is, rasping, growling, crackling, and about as soulful as it gets. Try listening to his self-penned opening song I Don't Believe, for instance, without shedding a tear - or if you think you're real tough, without almost shedding a tear. Head is a bona fide musical gem, a fixture in the late night bars of Sydney since 1980, his presence sighted in New York's after hours piano bars more than a decade ago. A magnet to discerning music lovers, a sanctuary to others, Peter Head is the one who showed Bon Scott how to write and structure songs and play guitar. He and his 70s rock outfit, Headband, supported Elton John and the Rolling Stones and he's since provided backing, musical arrangements, and supportive morale to hundreds of the country's finest singers and musicians - far too many to mention here. 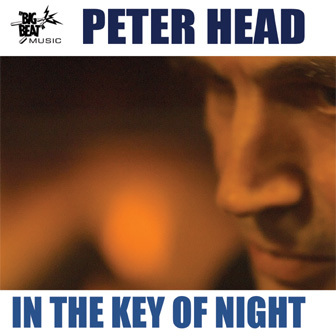 This excellent set, beautifully recorded with passion and empathy by the adventurous Big Beat Music label shows Peter Head in his best light yet, highlighting his splendid songs like I Don't Believe and Everything Is Everything. Head's fresh interpretations of songs from a few of his heroes like Tom Waits, Randy Newman and Ray Charles are not only commendable, but demonstrate the uniqueness of his voice and his very original phrasing. Not to mention his world class piano playing. A master.